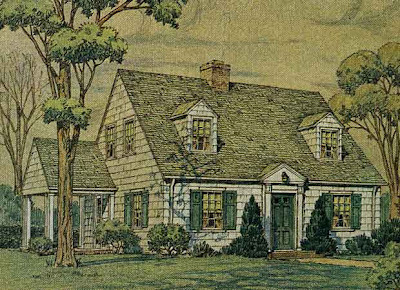 The Richmond, a Liberty Home by Lewis Manufacturing of Bay City, Mich., from a catalog published in 1939. From the web site Antique Home. I'm a research geek. I'm also a history geek. 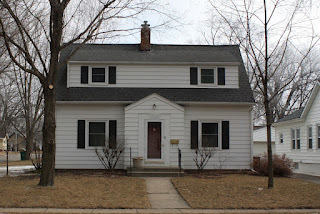 So, it was only going to be a matter of time before I went all geeky on the history of my house, built in 1939. Despite all the good stuff out there on the Internet, you'd be surprised what's NOT out there. 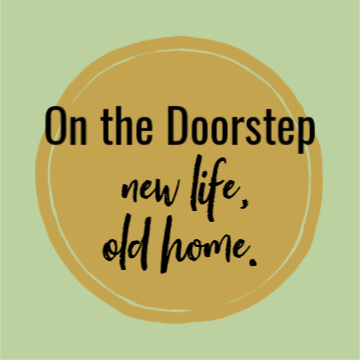 So while I was able to pin down the label to stick on my house, which is 1930s Colonial Revival Cape Cod, it was less easy to find out a lot about the era, and WHY that architectural style was so popular with the masses during that time. Mr. Man Friend, a cultural studies academic, was able to help track down a wonderful article, "The American Colonial Revival in the 1930s," by David Gebhard, published in the Winterthur Portfolio, 1987. Here is what I learned from the article, as well as from my own on-line research. By the 1930s, Colonial Revival was nothing new. In fact, elements of colonial style, including the Federal, Georgian, and even some Tudor elements (which borrow more heavily from the colonies' English heritage) were in the mix since the 1870s, when the country's first centennial of independence from England generated a higher level of interest in the colonial style. 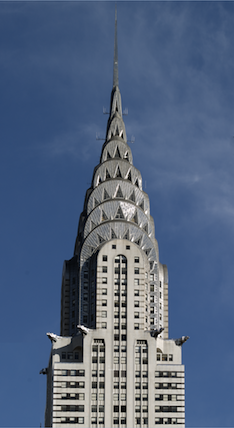 I'm sure you're familiar: The Chrysler Building ca. 1929-30. Public Domain photo, Library of Congress. The Club Moderne Diner in Anaconda, Mont. Photo in the public domain, Historic American Building Survey. 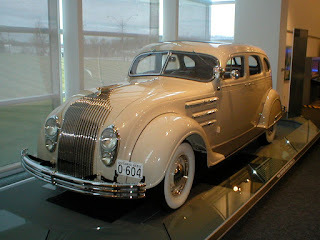 A 1934 Chrysler Airflow, by Randy Sterns. A Wikimedia Commons Photo. While Americans seemed to embrace those design movements in everything from their commercial buildings to their cars and diners, when it came to the homes they lived in, they just didn't go for it. Instead they went searching for elements of the country's past. It was in the 1930s that Colonial Revival got a second wind. A second wind that lasted until right spang in the middle of the mid-century, when ranch homes became the new vision of modern. 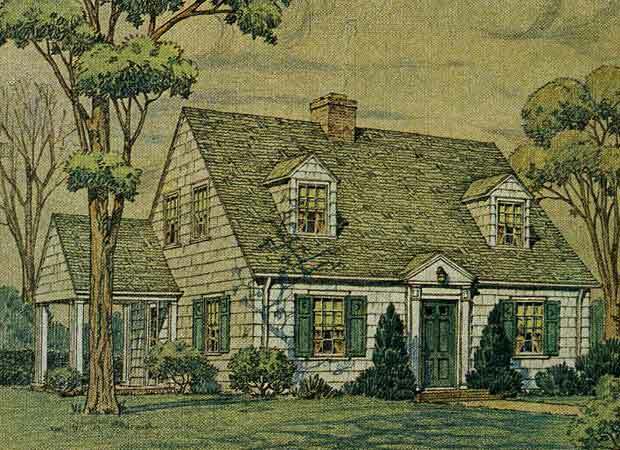 By 1939, the same year my house was built, builder's catalogs were full of homes for the working and middle class American family, plans with variations on the Cape Cod like the photo at the top of the blog entry. 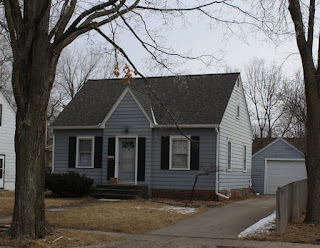 The image source Antique Home is a web site with tons of examples of home plan catalogs from the period. The Cape Cod and all its permutations were the architectural version of "the little engine that could." In his Winterthur article, Gebhard quotes T.C. Hughes, then secretary of the Detroit chapter of the American Institute of Architects, who in 1939 said, "Jigsaw exteriors, overdone bungalows, and false gabled English were among many passing fads, while good colonial, early American, and Georgian have stood the test of time. If well done, they will always be good." Just down the block from my house. The black shutters are a classic. 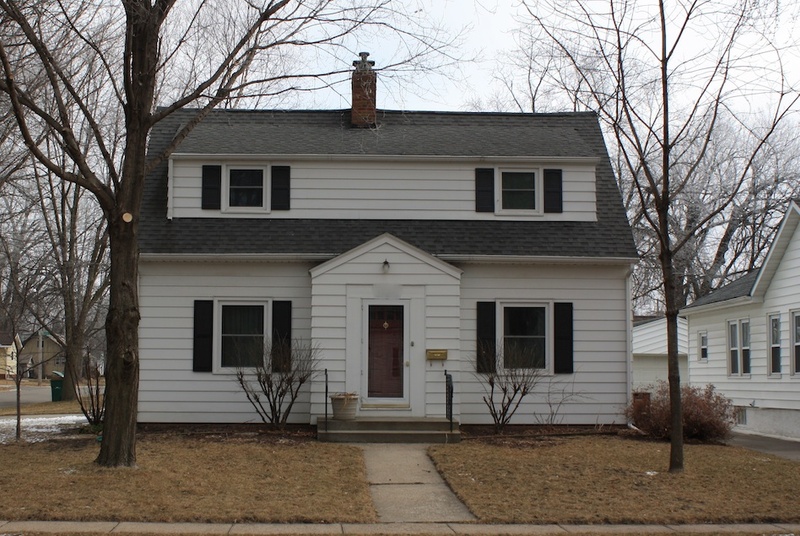 The gable entry was a common design nod to Midwestern weather. 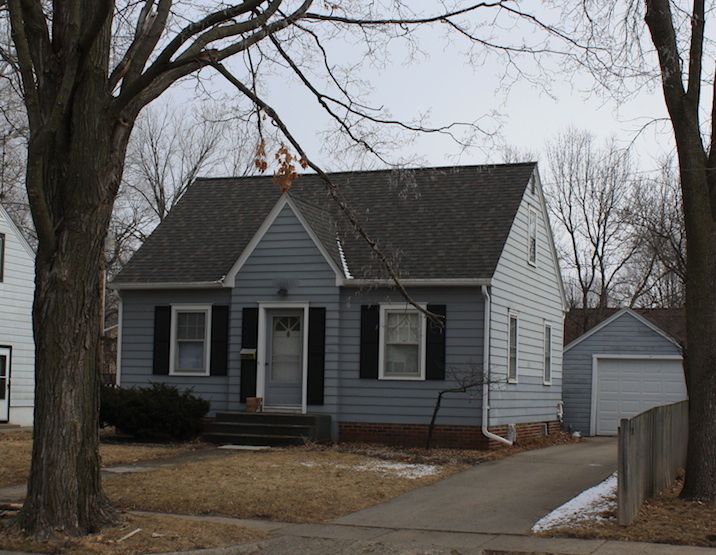 Not only the gable entry, but a full dormer across the front. Still classic: the center chimney, the shutters, and the symmetrical style. The builder of my house chose a style with a front gable, most likely to add more buildable square footage to the upstairs. Cape Cods were often built with the second floor unfinished for future family growth. My house is two bedrooms down, two up. There is still yet another room that could be finished. Does it look big enough to be a five bedroom house? I don't think so either! The variations of the Cape Cod were found in middle class neighborhoods from coast to coast. What happened during that decade? The great public projects and wealthy private clients with unlimited funds for mansions disappeared, and architects turned to the bread and butter of residential home building to make their money. To make themselves a name in this market, they had to satisfy their clients, working and middle class families. In turn, the Great Depression meant people had smaller families. And when they had the money to build a home, it was often with much fewer dollars than previous generations. They were looking for economical, modest-sized homes. The Cape Cod fit the bill, and many architects worked to popularize and modernize the Cape Cod to a generation that now expected electricity, indoor plumbing, and modern kitchens. 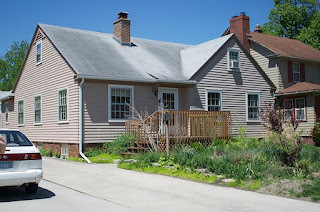 One of the best was Royal Barry Wills, and Pam Kueber over at the blog Retro Renovation has an absolutely excellent discussion of his contribution to the Cape Cod and Colonial Revival Style here. 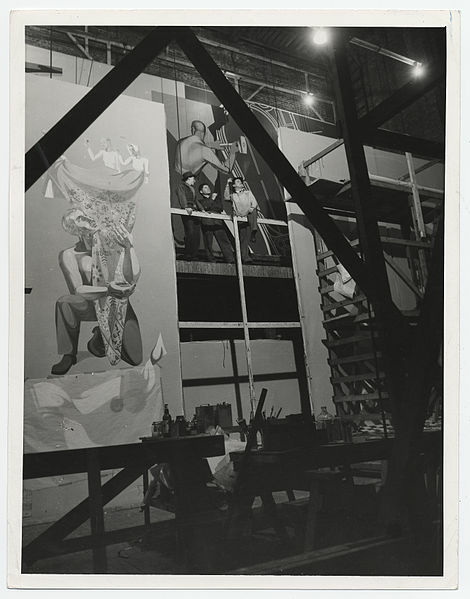 Mural work on the Works Progress Administration Building for the 1939 World's Fair in New York. Part of Franklin D. Roosevelt's ambitious New Deal, between 1935 and 1943, the WPA provided almost eight million jobs. Public domain photo, from the Smithsonian. As a person with an interest in the history of media, I peg the "Golden Age" of the magazine from about 1925 to the mid to late 1940s. It was an era before television had taken hold, and print technology and mail delivery had both developed to the point that mass production of colorful, well-photographed weekly magazines like Life, Look, the Saturday Evening Post were possible. They fed a national audience that could vote with news stand sales about the topics that interested them most. Monthly home magazines like Better Homes and Gardens and Ladies Home Journal featured house plans that appealed to their readers--middle class Americans. Life Magazine hosted an architectural competition in 1938 and published 8 winning designs in "Eight houses for modern Living," the Sept. 26, 1938 edition of the magazine (note: yes, I'm hunting Ebay for a copy!). Another competition was held in 1940. The clear winner overall was Colonial Revival architecture, Gebhard notes. According to Gebhard, interest in Colonial architecture in the 1930s was coming from several fronts. 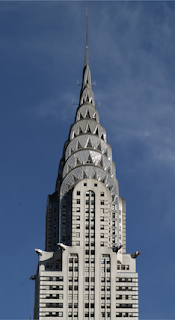 During the 1920s, architecture as a profession had gained an appreciation of the nation's design heritage, and many journals were dedicated to thoroughly analyzing the proportions and details of the various kinds of Colonial design--the Federal, the Georgian, and the Cape Cod. Gebhard estimates that starting from the 1920s, by 1941 the amount of architectural information about the Colonial period had roughly doubled. Secondly, there was somewhat of a national movement to preserve the country's founding history. The Rockefellers moved forward their preservation of Colonial Williamsburg in earnest during these years. Detroit automobile mogul Henry Ford was creating Greenfield Village. More in the popular mainstream were the photographs and colonial furniture reproductions of Wallace Nutting and the New England photography of Samuel Chamberlain. They all fueled a market for not only New England style architecture but furniture, wallpaper, and decorative items that imitated the home life of our colonial forebears. 1935, by Dorothea Lange. 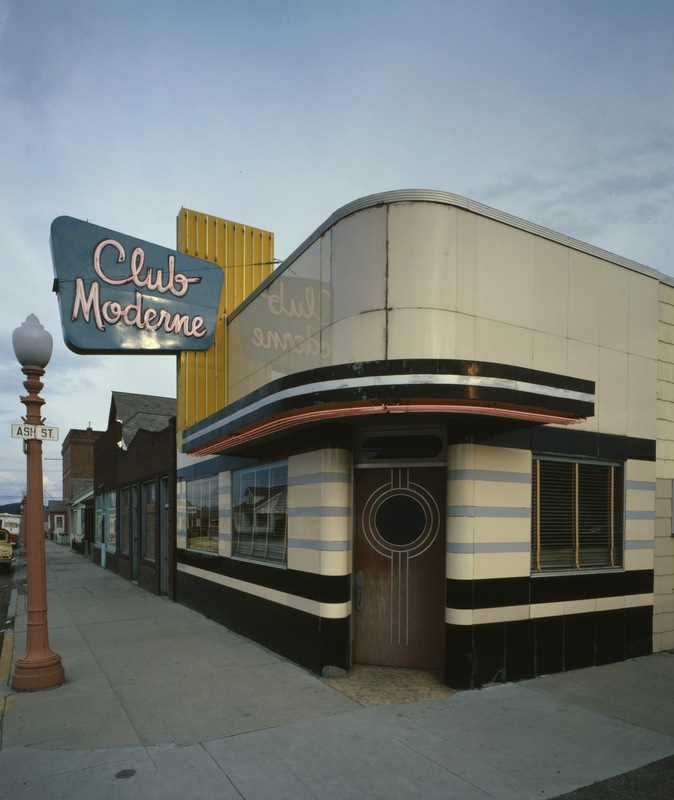 A public domain photo from Franklin D. Roosevelt Library. Wikimedia Commons image. 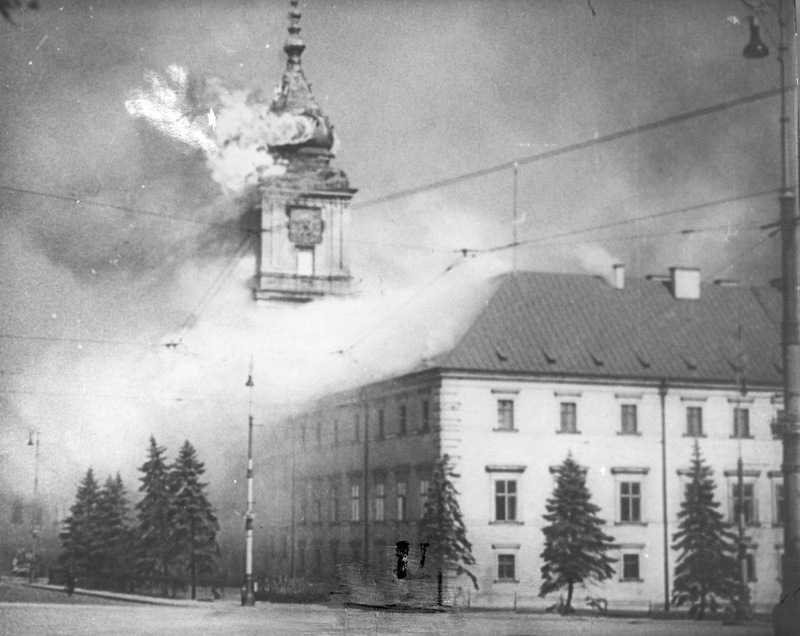 The burning of the Royal Palace of Warsaw Poland after German invasion, Sept. 17, 1939. A public domain photo from Wikimedia Commons. I believe the American people of the 1930s saw something of value in the life of their colonial forebears. I believe they saw the dignity of work and industry as a key to the nation's success; I believe they held dear the country's founding ideals of independence and democracy. I believe they were looking for a comforting and familiar foundation from which to face the tribulations of the first half of the 20th Century. My Cape Cod may be modest, common, and populist, but it is also the history of everyman America, the history that held our daily newspapers and Sunday dinners, our baby clothes and family photos and back-yard tomatoes. It's the only kind of history that most of us ever get to live. I'm proud to own a little piece of it. Very interesting! We have a Cape Cod, too, so I enjoyed reading about the style. Fascinating! It's such a sweet house that you have - and no, it definitely doesn't look that big! Glad you found it and that my research helped someone else! There's a big love affair going on with mid-century ranches right now, and I think that's great. But there are also tons of little Cape Cods and Tudors from the 30s and 40s that are just as special. Glad you're part of the club.